As I mentioned in Part 1, weakness or poor neuromuscular control of the periscapular muscles has been implicated in subacromial impingement1,2, lateral epicondylalgia3-5, cervicogenic headache6, and neck pain7,8. Although a cause-and-effect relationship cannot be confirmed, this preliminary evidence still lends support for targeting the periscapular muscles in individuals with neck or shoulder pain. According to Reiman et al.11 and Escamilla et al.12, moderate EMG activation (21-40% MVIC) is best used to facilitate endurance and neuromuscular re-education; high activation (41-60+% MVIC) – to promote strength gains. Primary Function: scapular upward rotation, external rotation, posterior tilt at the acromioclavicular joint, protraction of the clavicle at the sternoclavicular joint. 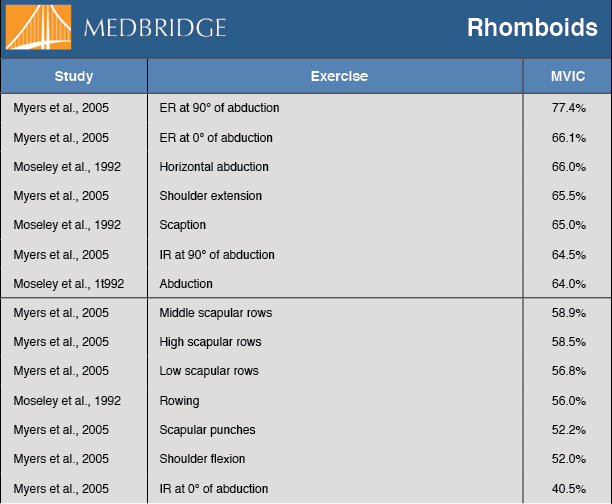 These studies give us a glimpse into properly selecting exercises, yet very few exercises have been or will ever be studied. your patient’s presentation, and goals for treatment.